It’s that time again … where I bare my face on the blog in the name of a legit foundation review! 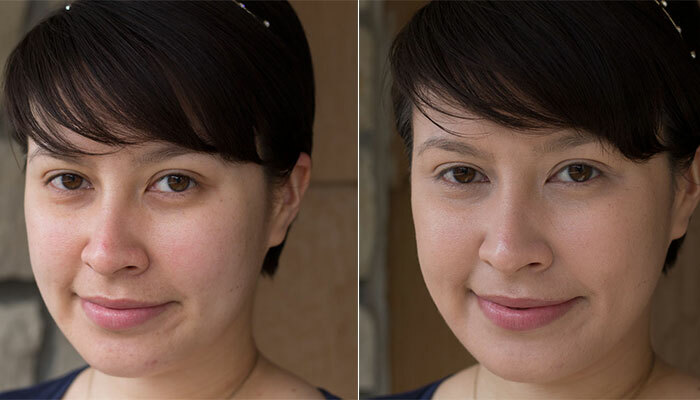 Gabriel Cosmetics recently sent me its Moisturizing Liquid Foundation for review, and you can’t deny the beautiful, medium coverage it offers. I’m prone to darkness around my eyes and redness around my nostrils, and Gabriel’s Moisturizing Liquid Foundation evened out my skin just like that. This creamy complexion enhancer does feel a little slick on my combination / oily skin. I don’t really need a ton of moisture, and this is definitely a foundation you want to set with a powder to keep it from slipping around once you’ve completed your look. If you’re a bit heavy handed (raises hand), remember to go slow and build your coverage only where you really need the help. You don’t need much of this medium coverage foundation, and it blends beautifully with a foundation brush (my favorite). For those of you who like multipurpose beauty products, Gabriel’s Moisturizing Liquid Foundation contains SPF 18 thanks to titanium dioxide. Aqua (Infusion of Aloe Barbadensis Leaf Juice), Sesamum Indicum (Sesame) Seed Oil, Sorbitol, OenotheraBiennis (Evening Primrose) Oil, Persea Gratissima (Avocado) Fruit Extract, Aloe Barbadensis Leaf Extract, Simmondsia Chinensis (Jojoba) Seed Oil, Glycerin, Cetearyl Alcohol, Butyrospermum Parkii (Shea Butter), Crithmum Maritimum (Sea Fennel) Extract, Tocopheryl Acetate, Retinyl Palmitate, Limonene, Lecithin, Silica, Xanthan Gum, Iron Oxides, Titanium Dioxide, Potassium Sorbate. Quite honestly, I’ve been a bit lax with sunscreen on my face lately, relying solely on natural SPF that my daily facial oils offer in addition to my foundation, so this is a big bonus for me. At $28 for a 1-ounce glass jar that’s readily available at Whole Foods, Gabriel’s Moisturizing Liquid Foundation is a bargain. It’s not on my repurchase list for spring / summer because it’s not quite right for my skin type — and I’m only going to get oilier as the weather gets warmer — but I’ll definitely consider purchasing this for fall / winter because of the added moisture it provides. Have you tried Gabriel’s Moisturizing Liquid Foundation? What’s your favorite natural foundation? Tell me in the comments section!